We have all seen limousines rolling up the drive at wineries, usually with a bachelorette and her party spilling out for another session of wine tasting. And with the skyrocketing popularity of craft beer breweries, there are a number of companies offering brewery tours, usually in vans or buses. But what about combining the two and visiting your favorite local breweries in a limo? 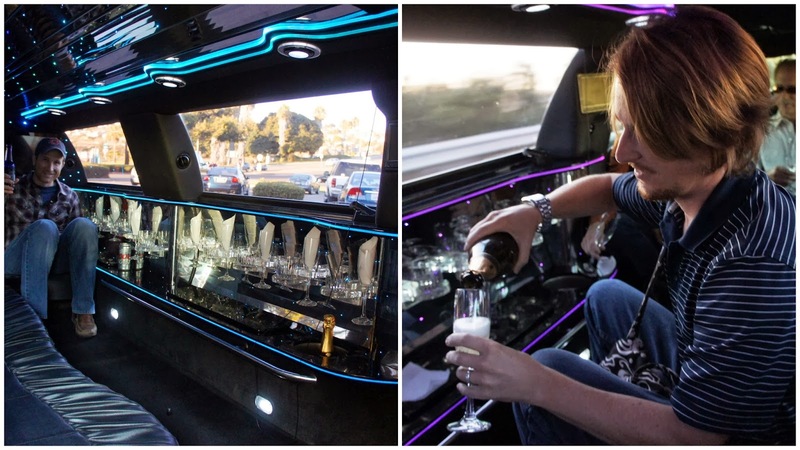 I was lucky enough to be one of a small group invited to be guests of Aall In Limo & Party Bus, a limousine company that offers San Diego limo brewery tours. As soon as we took off in the limo to our first brewery one of the benefits of taking a limo brewery tour became immediately apparent. Free champagne! We had barely hit the freeway when the group voted unanimously to pop open the bottle of champagne that was sitting in the bar begging to be consumed. What better way to start a limo brewery tour than with a round of champagne? Thanks Jeremiah! Our first brewery stop was Mission Brewery, a microbrewery located in downtown San Diego steps away from Petco Park and the Gaslamp District. I have lived in San Diego my entire life and so am very familiar with the Mission Brewery building, which housed the original Mission Brewery from 1913 to 1919. The current Mission Brewery started in 2007 and pays tribute to its pre-prohibition predecessor. Today’s Mission Brewery is located in the old Wonder Bread building built in 1894. Our Aall In Limo & Party Bus limousine in front of San Diego's Mission Brewery. The inside of the brewery is huge and gorgeous, with vaulted wood beamed ceilings, large cast iron chandeliers, a long wood bar, and big shiny fermentation tanks. I chose a four-taster flight of the Mission Amber, El Conquistador, Mission Dark Seas, and Carrack. I am a dark beer girl, so the Mission Dark Seas was my favorite. Mission Dark Seas is a Russian Imperial Stout with a pretty high alcohol content at 9.8%. It was dark and smooth with a strong coffee taste. The Carrack, an Imperial Red Ale, was my second favorite. It also has a high alcohol content at 10.2% and had a rich malt taste. The Mission Amber, a Dusseldorf-Style Altbier, and El Conquistador Extra Pale Ale, a session-style American Pale Ale, were too light for my taste. Everything about the interior of Mission Brewery is beautiful, including the shiny fermentation tanks. In addition to San Diego’s excellent craft beer scene, there is also a quickly emerging food truck industry, and while many breweries do not or cannot sell food, they arrange for food trucks to provide nourishment for their beer tasting customers. I accompanied my beer flight with Heavenly Baja Tacos’ hand beer battered fish tacos with pickled red cabbage coleslaw, red hot salsa, and chipotle cream salsa. The fish tacos from Heavenly Baja Tacos tasted heavenly, especially with my Mission Brewery beer flight. We left Mission Brewery and drove across the Coronado Bridge to Coronado Brewing Co. Coronado Brewing Co. has been around since 1996, before the boom of San Diego’s craft beer movement. Their Coronado location is a brew pub, so also serves food. You can either order the preselected taster set or build your own. I chose the CBC Milk Stout, El Borracho Brown, Blue Bridge Coffee Stout, Scallywag Barley Wine, and Black Sails IPA. My favorite, and in fact a crowd favorite, was the CBC Milk Stout. This stout is very thick and creamy, not a good choice for a daytime beer, but the best choice for an evening beer. CBC Milk Stout is like dessert in a glass, with notes of chocolate, brown sugar, and toffee, almost like a beer milkshake in the very best way. Coming in at a close second was the Blue Bridge Coffee Stout, with a low alcohol content of 5.4% and a fragrant coffee taste, achieved by brewing the beer with dark roasted coffee beans from San Diego’s Café Moto. This is a refreshing daytime dark beer. I also enjoyed the El Borracho Brown, which surprisingly had a stronger taste than the coffee stout. It is a malty ale with mild hops. While I am not the biggest fan of IPAs, the Black Sails IPA was enjoyable, with a strong but not overwhelming taste of hops. I decided to try something a little different with the Old Scallywag Barley Wine, a strong English-style ale, but it was too sweet and thick for me with a very strong alcohol taste. 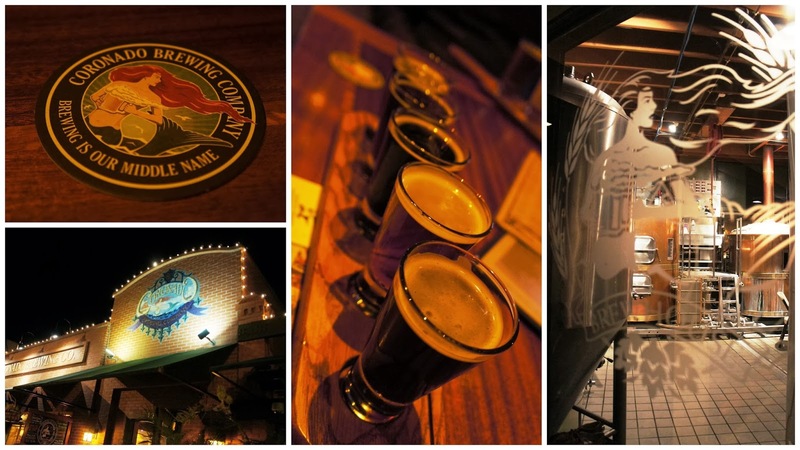 Coronado Brewing Co. Brewing is their middle name. Sadly, all good things must come to an end, and that was the end of our limo brewery tour. The next time you and your friends are planning a night out on the town or a mid-afternoon brewery tour in San Diego, consider touring in style with Aall In Limo & Party Bus. You can either choose your own brewery route, or they will suggest one for you. James welcomes us back into the Aall In Limo & Party Bus limousine at the end of our San Diego brewery tour.